Raaga.com: Can Salman Khan out beat Aamir Khan in acting department? Can Salman Khan out beat Aamir Khan in acting department? Aamir Khan and Salman Khan are Bollywood’s two most sort after superstars both having a distinct fan following. While Aamir Khan’s fans are restricted to the multiplexes thanks to his reservation for ‘Thinking’ cinema i.e. movies like 3 IDIOTS, PK, LAGAAN etc; in contrast Salman’s fans range from multiples to single screen theatre due to his penchant for doing action packed ‘Popular’ cinema i.e. movies like KICK, BODYGUARD, READY etc. However after Salman Khan did BAJRANGI BHAIJAAN, he was flooded with appreciations that once eluded him and were usually constrained just to Aamir Khan for opting for good cinema and power packed performances. In fact even Aamir Khan praised Salman Khan for his superlative performance in BAJRANGI BHAIJAAN and expressed his concern that if Salman had shown such maturity at the beginning of his career than he would have had many good movies to boost upon. Thus after BAJRANGI BHAIJAAN Salman Khan has decided to be selective and do quality movies. Hence when young film director Ali Abbas Zafar narrated him the script of SULTAN he did not hesitate to accept the movie despite the fact Aamir Khan was doing a similar film DANGAL having a wrestle backdrop. Call it Salman’s sharp vision or his sheer luck; the first look of SULTAN has taken film buffs by storm. Interestingly Mr. Perfectionist Aamir Khan, who had been garnering publicity due to his dedication to his profession by beefing up his body to match up to the look of his character in DANGAL has failed to impress his fans! In contrast Salman Khan, who too has been working on his body to live the character of a wrestler in SULTAN, has succeeded!!! In a poll conducted by a popular filmy website film buffs have given a tremendous applaud to Salman Khan’s SULTAN look rather than Aamir Khan’s DANGAL look. 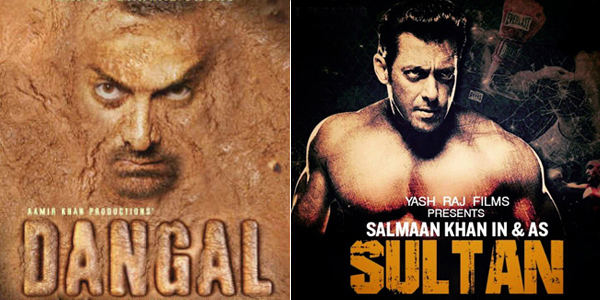 According to the poll results 70% of the film buffs have highly praised the rustic look of Salman Khan in SULTAN while Aamir Khan’s earthy look in DANGAL has fetched just 30% votes. Thus it seems Salman Khan too is getting into the perfectionist mode and is all set to give a tough fight to Aamir Khan!!! However looks do not matter much it is the performance that counts. Thus the question is can Salman Khan out beat the veteran Aamir Khan in acting department! Readers give your vote….